Wardenclyffe History: Learn about Tesla's dream to transform farmland on Long Island into a "Radio City" for transmitting wireless energy. Hear the story of Wardenclyffe's conception, construction and controversial past. Laboratory: Get a close-up look at the exterior of Tesla's workshop at Wardenclyffe, and discover the unique features of this historic building where Tesla brainstormed and built his inventions. Tower Base: Explore the octagonal base where Tesla's legendary wireless transmitting tower once stood. Learn facts about the tower's history--and the mysterious questions that remain. Bricks for Nik Plaza: Visit one of Wardenclyffe's most unique features, built from bricks donated by Tesla fans from around the world and engraved with inspirational messages. 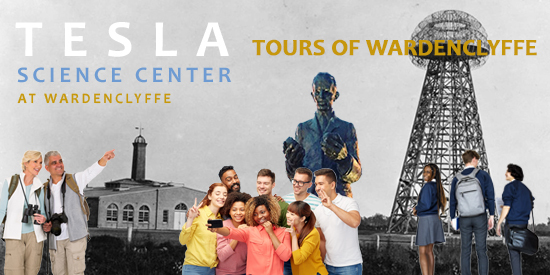 This is also the perfect spot for a photo op with Wardenclyffe's larger-than-life statue of Tesla. The Future at TSCW: Get an exclusive look at the future of Wardenclyffe. Learn about Tesla's contributions as an inventor and humanitarian, and how his legacy continues as TSCW develops Wardenclyffe into a center for education, research and entrepreneurship. WHAT TO WEAR: Dress in comfortable clothes and walking shoes. WHAT TO BRING: Bring water, sunscreen, sunglasses, and insect repellent to protect against ticks. Bring camera and binoculars if desired.